Hello lovelies! I am so happy to introduce Matthew Turner, author of Beyond Parallel, to you all :) Get to know Matthew Turner, a little bit about his book, and the usual random questions that are really good to know about. 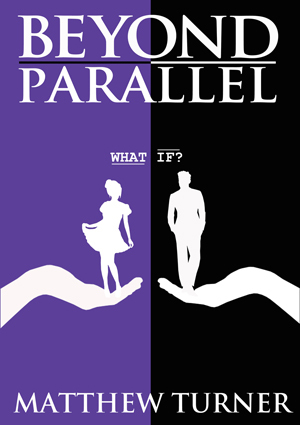 Before we start the author interview, let me show you the cover artwork of his book, Beyond Parallel. Ara: Hi Matthew! Welcome! I take that you’re busy, busy, busy this month since it is the release of your new book, Beyond Parallel. I’m so happy that you are able to join us today for a short interview. Please tell us a little bit about yourself. Matthew: Hi, thanks for having me. My name is Matthew Turner and I’m a writer. I’ve been writing for several years now, but it’s only been in the last couple that I’ve taken it to the next level. The end result of this is Beyond Parallel, my debut novel that launches on the 8th January. Ara: Interesting! And you are, indeed, busy! So, you write both Fiction and Non-Fiction books. Is one easier than the other? Matthew: Good question. I’ve only just begun my first non-fiction project, but I feel it might be an easier process than writing fiction. Writing a novel is so precise. You have to consider the reader on so many levels and create a world that takes their imagination with it. Non-fiction is more about the content, and the information on offer. It’s not to say the story isn’t important, but it’s less of an art form. This, in some ways, makes it easier, although if you ask me in a year’s time I may sing a different tune. However, my current non-fiction project will take a long time and is very time intrusive. All in all, they are both completely different species. Like most things, they have the good, the bad, and the ugly. Matthew: No we’re not, our time together was a complex one, and it ultimately made it impossible to remain friends. We tried, and who knows what the future holds, but at this stage in my life it’s nice to look back on. And she does know, yes. We share many mutual friends so I believe it’s made its way through the grapevine. I’m not sure how she will take it overall. I’m sure she’ll love some parts and hate others. Saying that, I’m not sure if she’ll ever read it. I would imagine it would be hard to do so. Ara: I would think so, too. Relationships, sometimes, are really complicated and it’s just a matter of how we deal with it – during and after. Well, I wish you both well. I’ve read the book’s description and I have to say, I’m rather excited to learn more about Bella and Clark. And that particular ‘what if’ moment. The suspense is killing me, actually. Could you tell us a little bit more about the two characters (Bella and Clark)? Matthew: The idea of what if has always fascinated me. I wanted to build the foundations of Beyond Parallel around this, and push Bella and Clark in the middle of it. They are quite different from each other. Bella loves to love and is a real old fashioned romantic. Whereas Clark is terrified of commitment and has spent most of his life avoiding it. However, they both share a great deal of common ground, too. Their entire lives are ahead of them and they want to achieve so much. The problem with this is that much of it contradicts one another. They are ultimately trying to find a balance where happiness can be found, and as I’m sure most young twenty-somethings appreciate, this is far from easy. Ara: Hmmm.. They sound amazing! Let’s talk about the concept of ‘what if’. Most of us are probably familiar with that kind of moment, the ‘what if’ moment. I mean, there were circumstances in my life that I did wonder ‘what if’… What if I didn’t do this.. or that.. instead of this. Something like that. And I understand that Beyond Parallel clings to ‘what if’. What inspired you with that concept? Is it just the break up? Or something else? Matthew: I’ve always been fascinated by the concept of what if, but it was the breakup that really brought it into fruition. For months I spent my time wondering about what might have been had I chosen differently, and it made me consider other moments in my life, too. All I could think about were all the lives I could have lived. Life, when you think about it, is one giant butterfly effect, and it doesn’t only hinge on your decision, but others, too. In a way we’re all connected, and the decisions other people make determine so much about who we become. It’s bloody terrifying and amazing all in one. Ara: I agree with you. I tend to see it that way sometimes as well. That we are somehow connected. So, what’s your biggest ‘what if’? Matthew: My life is a montage of what ifs, so it’s hard to choose just one. I suppose it’s the breakup in 2006 that I think about the most, though. For instance, I wouldn’t be doing this interview right now that is for sure. Beyond Parallel had one muse, and without her it wouldn’t have been written. I think 2006 was a big year for me and set some rather significant wheels in motion. I have no idea where I would be if I had said yes to her, but I wouldn’t be where I am now. I have to ask. Coffee, sweet tea or hot cocoa? Ara: If you have to choose one fiction book as your absolute favorite, which book will it be? It’s a tough question :) But if you had to choose one, which book will it be? Ara: Hah! Finally, who is your favorite ‘friend’ from F.R.I.E.N.D.S.? Matthew: Hmmm, good question. I used to love Rachel growing up (ultimate crush), but now when I re-watch them I’m drawn to Monica. So I suppose it’s a toss-up between those two. Ara: Oh, I love them both. This is actually a hard question for me. I’m an ultimate F.R.I.E.N.D.S fan and I love them all. I can’t choose just one. :) Thank you for your time today, Matthew! It’s really great to have you here @ My Book and My Coffee. Matthew Turner is a young writer from Yorkshire, England. He writes both Fiction & Non-Fiction, but his latest project is Beyond Parallel, a coming-of-age novel that focusses on two young twenty-somethings. After years of playing with the idea of writing, he decided to take things seriously in 2010. He took his four year old manuscript and ripped it apart; refining it, editing, and learning until the final copy was ready. That time is now! 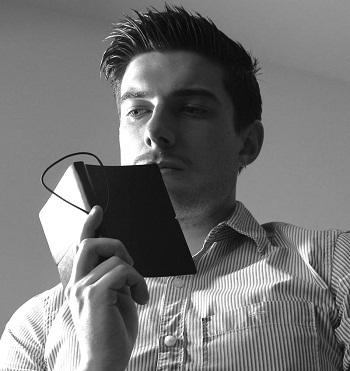 As well as writing, Matthew acts as a consultant, speaker, and coach to fellow writers and entrepreneurs. With a passion for storytelling and creating brands with soul, he finds himself working with innovative, 21st-century minds.